"New Yorker "writer Dana Goodyear combines the style of Mary Roach with the on-the-ground food savvy of Anthony Bourdain in a rollicking narrative look at the shocking extremes of the contemporary American food world. A new American cuisine is forming. Animals never before considered or long since forgotten are emerging as delicacies. Parts that used to be for scrap are centerpieces. Ash and hay are fashionable ingredients, and you pay handsomely to breathe flavored air. Going out to a nice dinner now often precipitates a confrontation with a fundamental question: Is that food? Dana Goodyear's anticipated debut, "Anything That Moves," is simultaneously a humorous adventure, a behind-the-scenes look at, and an attempt to understand the implications of the way we eat. This is a universe populated by insect-eaters and blood drinkers, avant-garde chefs who make food out of roadside leaves and wood, and others who serve endangered species and Schedule I drugs a cast of characters, in other words, who flirt with danger, taboo, and disgust in pursuit of the sublime. Behind them is an intricate network of scavengers, dealers, and pitchmen responsible for introducing the rare and exotic into the marketplace. This is the fringe of the modern American meal, but to judge from history, it will not be long before it reaches the family table. 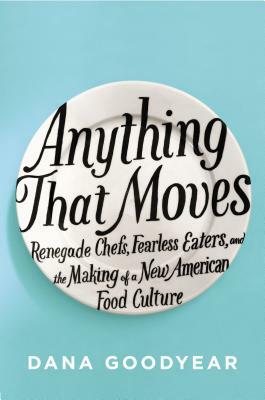 "Anything That Moves "is a highly entertaining, revelatory look into the raucous, strange, fascinatingly complex world of contemporary American food culture, and the places where the extreme is bleeding into the mainstream. Dana Goodyear is a staff writer for "The New Yorker." She teaches at the University of Southern California.